The Pack sponsors one family oriented hike per month throughout the year. Check the Pack calendar or see below for dates. Dens take turns leading each hike. The hikes are family events; all scouting ranks along with their parents and siblings are encouraged to attend. Due to liability issues friends that are not members of Pack 36 may not attend. The hikes are typically 2 to 3 miles long, length and the terrain is reasonable for the age of the Cub Scouts although may not be reasonable for younger siblings. Please review the hike location ahead of time with your family in mind. 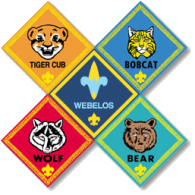 Many hikes will include a theme either related to the location or a special patch or elective. All hikes start with a mandatory check-in at Springer School at 1pm for a head count and to receive directions to the trailhead. The Hiking Coordinator tracks attendance and mileage for all Scouts who attend a Pack sponsored hike. Each Scout is awarded various items through participation in these activites. Hiking Compass: Scouts earn a Hiking Compass after logging 15 miles. Hiking Stick: Scouts earn a Hiking Stick after logging 50 miles. Camelback: Scouts earn a Hiking Stick after logging 75 miles. 1) Every child joining the hike needs a parent or guardian to fill out a consent form. I will keep them on file, so that the consent form only needs to be filled out once for the whole year. A blank copy of the form is attached to this web page. You are encouraged to fill out this form before we meet for the hike, though the hike leader will try to have copies available when we meet at Springer, and they are quick to fill out. 2) Every person, whether they are a scout or a family member, and whether they are a child or an adult, joining the hike needs to fill out a BSA Annual Health and Medical Record Form, parts A and B. This is true for all outings (den, pack, or council) so it's worth it to fill out the form once per year, keep the original on hand, and make a few copies for outings that require it. This form takes a bit more time to fill out, so please fill it out in advance. It cannot be done in the parking lot before the hike. The hike leader will collect the forms from all participants to have on hand during the hike, in case of a medical emergency. Participants who are concerned about privacy can put them in a sealed envelope before giving them to the hike leader at the beginning of the hike. The hike leader will return the Medical Record Form at the end of the hike or, if the participants prefer, keep them on file for future hikes.